Spotify has chosen an unconventional way to go public. So what exactly is a direct listing? 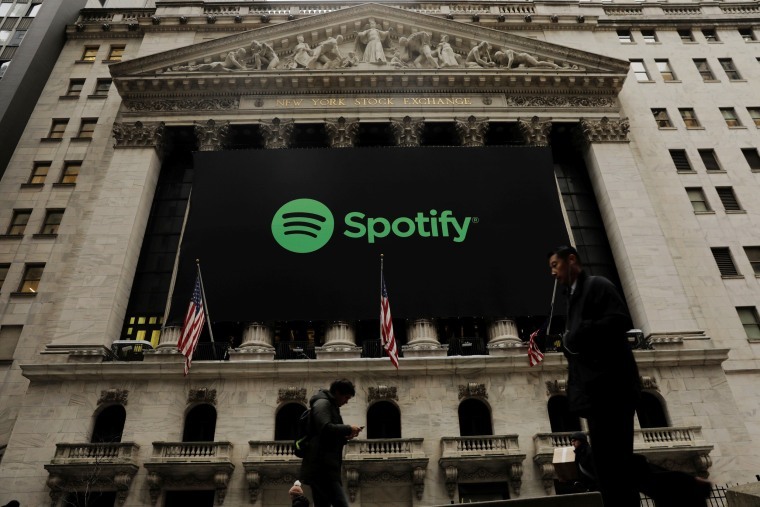 Spotify's unusual path to going public on the New York Stock Exchange sparked curiosity among tech watchers and traders keen to see how the popular streaming service would fare on its first official day of trading. The answer came swiftly. Trading under the ticker symbol SPOT, shares in Spotify soared 28 percent on Tuesday morning. But don't call it an initial public offering. Spotify left the ranks of other unicorns — the nickname for privately held companies valued at more than $1 billion — and followed an unconventional route to become a publicly traded company, opting for a direct listing. A typical path for tech companies going public includes raising capital through millions of new shares and working with a large Wall Street bank to serve as a stabilizer by underwriting the IPO. With Spotify's public debut, there are no new shares, meaning there are only the existing shares held by private investors and employees. The direct listing is good news for them, since their share values aren't being diluted. For potential investors, it will be a case of whether the limited number of shares available will meet the demand of a hot new tech listing. "A direct listing is a pretty unconventional way for a company to go public, in that they are not necessarily issuing new shares and having a traditional IPO that is underwritten," Caleb Silver, senior vice president and editor-in-chief of Investopedia told NBC News. "Basically, it's a chance for existing shareholders to sell their shares to the public through the exchange." Spotify CEO Daniel Ek said he opted for the untraditional route because "Spotify has never been a normal kind of company." "Spotify is not raising capital, and our shareholders and employees have been free to buy and sell our stock for years," he said in a letter posted on Monday. "So while tomorrow puts us on a bigger stage, it doesn’t change who we are, what we are about, or how we operate. This is why we are doing things a little differently." With 71 million paying subscribers, Spotify has almost twice as many listeners as its closest competitor, Apple Music, and is valued at an estimated $19 billion. The company's decision to bypass the big investment banks is saving millions of dollars in fees. Silver said the banks will be watching to see how Spotify performs without their help. If it's a success, he said the unorthodox listing could inspire other unicorns to follow suit. If timing is everything, Spotify could be in for a tough ride. The company made its public debut as tech stocks continue to take a nosedive. Amid fallout over its privacy practices, Facebook has lost nearly 20 percent of its value in the past month, shaving billions of dollars off embattled CEO Mark Zuckerberg's net worth. Amazon stock has also slid amid worries of regulation as President Donald Trump continues to target the company on Twitter. Perhaps the closest comparison for how Spotify might fare is Netflix. The two companies have drawn comparisons for their streaming subscription models. Netflix shares closed below the short term average on Monday for the first time this year, a barometer used to measure the momentum of a company and the attitudes of investors. "This is a test by Spotify to see how much the public thinks this company is worth," Silver said. "If its IPO is successful today, it is a good sign for Spotify and technology — but a rough sign for traditional banks."